So my cousin recently announced her engagement. It’s a big occasion for the family and everybody had their share of things to be excited about. For her parents, they are glad to have a child finally heading towards settling in happy matrimony. For my grandparents, their first grandchild is getting married and they are thankful to god for letting them be a part of it. My parents are happy for her parents i.e. my dad’s brother and his wife. Of course we’re happy for her, but when it comes to weddings, I tend to get more excited about the fact that I get to buy new clothes! And if you think the matter ends here, then you’re wrong. 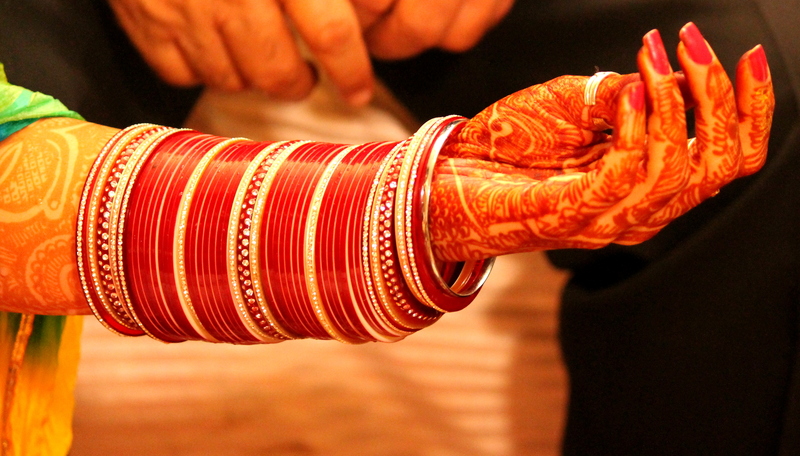 How can a wedding be fixed in India without the whole extended family being involved? Oh no sir! We first need to meet the future son in law. And by ‘we’ I mean the entire family. Yes. The WHOLE family will meet the boy and his parents. Even though my uncle and aunt have already paid a visit to his house and met his parents, but we still need to get everybody’s opinion. And let me tell you, meeting the future son in law is a very big deal here. Because in our culture the son in law is an extremely important person. So to meet him and his family, a date and venue was decided. And since me and my sister have already met this guy a couple of times, we stepped back from attending the Oh So important meeting! My grandma took things so seriously that she called up my mom to ask whether she should wear a sari or not! To which my mom casually replied that it was too hot to take care of the sari and besides it was not that big a deal. To this my grandma very gravely replied that meeting the future son in law is a very important task. It should not and would not be taken lightly. The finest cashew nut Barfi was ordered and everybody was ready before time. For my family, getting ready on time is an impossible task. So getting ready before time was a miracle! Before leaving my grandma went over every preparation once again. Sweets packed and kept in the car. Check. Sagan envelopes. Check. Everybody’s clothes perfectly ironed. Check. Quickly everybody sat in the cars and off they went to meet the future damaad ji. Four hours and a dinner later they all came back with such mega watt smiles on their face that me and my sister could barely wait to get the feedback. The boy had passed with flying colors. His family was declared very decent and proper and his parents were highly appreciated. I and my sister looked at each and laughed thinking about the actual engagement ceremony that is to be held in some months. If a casual meeting with the future son in law is such an hyped event, then the engagement is surely going to be one hell of a party. It had been a long week. The vacations after the exams are always boring. All I’v done this week is laze around. During the exams you have this huge list of things that you just can’t wait to do. And the day the exams finish, you realize that this list is pretty useless because you end up doing more than half of the thing written on it in just a day. I’m lying on my bed looking up at the ceiling and all I think of is those eye’s. Those eye’s that just refuse to leave my mind. I clearly remember the first time I saw them. I had called my best friend, Rashi. Her brother had recently got married and we two had gone crazy getting our pictures clicked. In our defense, we had put in a LOT of effort to get ready and getting good pictures of us clicked was the only redemption possible for all that hard work put into figuring out the rocket science behind the mascara and those eye shadows. The pictures were due any day and we had been waiting for them with bated breath. I pushed the phone away from my ear and let her clear her vocal cords. I could hear her clearly despite the fact that the phone was a good 3 feet away from my ear. When she calmed down I gingerly put the phone back to my ear to confirm that she is no more screaming. “Why the hell are you screaming the house down you idiot?” I screamed back. “The pictures are here”, she said. Now I know why she had been so excited. “I’ll be there in 15 minutes”, I told her. I hurriedly brushed my teeth and took a quick shower. I found the first clean and ironed tee and jeans, put them on and tie my hair in a bun to avoid wasting time on brushing my hair. Her house is two blocks away. I ran there as fast as I could. She was waiting excitedly for me and we immediately got down to business. Forget the rest of the 500 guests that were there, we were busy sorting out our pictures. Our pictures were fabulous. We couldn’t believe our eyes. We looked at each picture repeatedly and laughed at the funny poses we made for the camera. When we finally got bored from looking at our pictures, we start going though the rest of them. Her brother’s fiancee looked great. I don’t know if it’s the make-up or a camera trick or if she really had that bridal glow. Looking at other people made us realize how hungry we were. Rashi had gone into the kitchen to get something to eat and that was when that face came up on the screen. I still remember that moment clearly. The moment when I first saw him. Her brother is standing with some guy and smiling into the camera. This guy had the deepest brown eye’s I had ever seen. Almost like they were trying to hypnotize me. This guy has such an infectious smile I could barely control myself from smiling. “Who is this guy?” I asked Rashi as she came back carrying a tray of the most yummy looking scrambled eggs and toast. That’s the thing about this girl. She’s an awesome cook. “Oh! I don’t remember seeing him here.” I said. 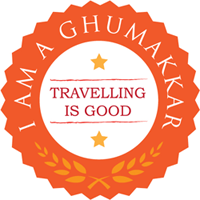 “Well, I so busy dancing and clicking pictures, I don’t think I noticed any other guest. And frankly with all those cocktails inside me, it was a miracle I noticed you!” I replied laughing. 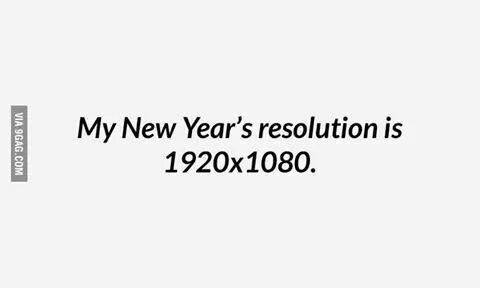 I looked back at the picture. It seemed like those eye’s were pulling me towards them. I had shaken that thought away and had happily dug into the amazingly delicious scrambled eggs. Today, nearly three m0nth’s after that day, I still can’t forget those eye’s. They refuse to leave my thoughts and everywhere I go, all I can think of are those eye’s…. Back to blogging after like a month of being inactive. And the excuse this time is that I had so much editing to do, that I just ran away from anything that required me to open my laptop. Believe me, I hate anything related to weddings right now because I’v only been thinking about them this past one month. First it was the preparation that went into all the planning for covering weddings, then came the weddings themselves and finally the mammoth task of editing thousands of pictures and shortlisting which are worthy enough to be given to the client. Phew! Whoever said weddings are supposed to fun and frolic, was never a wedding photographer. Anyways, I’l crib later. 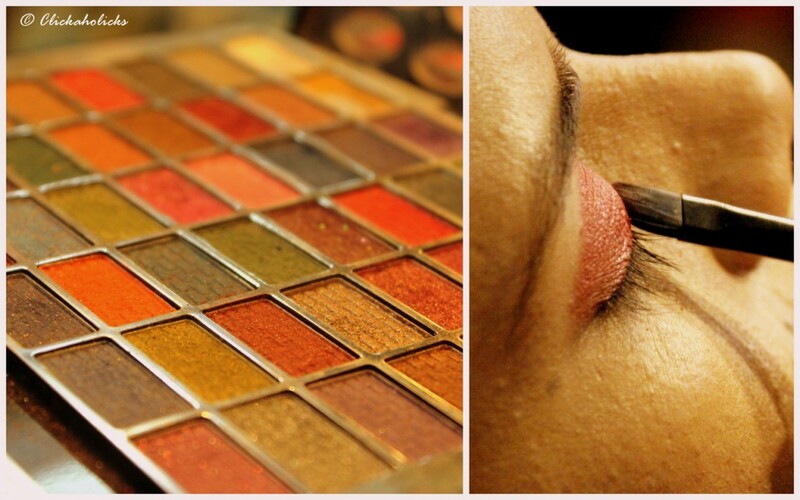 First let me take you guys through the wedding day of an Indian Bride. Actually the wedding day of the last bride I met. I Reached the venue at 7 in the morning on her wedding day and she was sitting there all ready and waiting for the rituals to begin. I can understand her not being able to sleep because of all the excitement but the poor girl went to bed at 2 in the morning after dancing for hours and here she was all ready and smiling. Her’s was a Sikh wedding which take place in the morning. Usually north Indian weddings take place in the evening so the brides have a comparatively comfortable day and the madness begin at night. But here, the bride was supposed to be up and ready early morning and get done with all the rituals so that she could reach the parlor and meet her beautician at 9. So when all the relatives were ready, the first ritual of the day began. The Chooda/Choora Ceremony.This is basically a Punjabi cultural ceremony where the Bride’s maternal uncles slip red and ivory bangles on her wrists which she would wear for the next 40 days. Bangles have a huge importance in the Hindu culture and married ladies are supposed to wear bangles all the time. The Chooda/Choora symbolizes that her wrists would never be empty from now on. In earlier days, the bride was supposed to wear her chooda for at least a year and the bride was refrained from doing any heavy household jobs. After the first anniversary, a small homely ceremony was held where the In-Law’s would remove her Chooda and Glass or gold bangles were placed on her wrists. The Chooda was then taken to a river and a small prayer was held after the which the Chooda was left to float in the river. My maternal grandmother’s Chooda was made of pure ivory and I remember her telling me that her chooda was floated in the river ‘Ganga“. 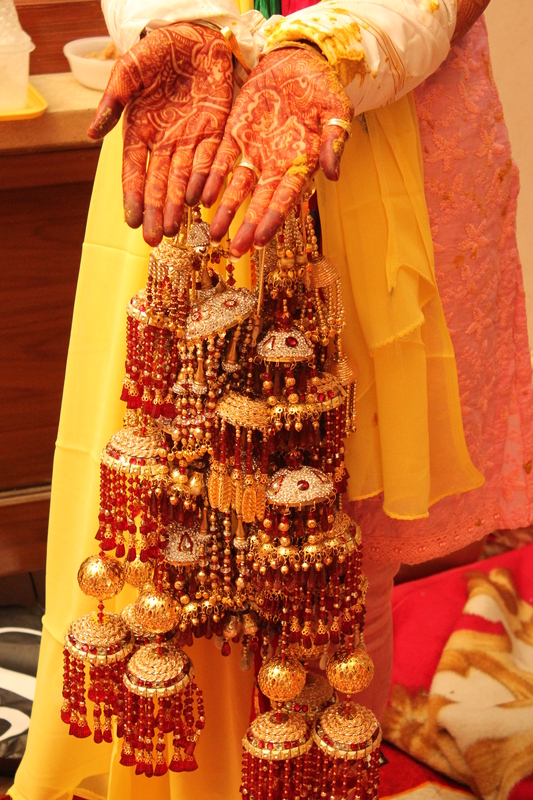 Also, After the Chooda ceremony, the family of the bride hangs ‘Kalire‘ on her Bangles. The kalirey traditionally were made of a thin metal usually golden or silver in color, and coconuts. The metal symbolizes wealth and prosperity for the bride and groom and the coconuts symbolized that the bride never runs out of food in her new home. After this ceremony, The bride picked up her dress and jewelry and headed to the parlor to get ready and actually become a Bride. So, now when the bride is ready and is all anxious for the baraat (The Groom and his relatives) to come, her sister’s and friends all come to her. Sister’s play a huge role in the wedding for a bride. They help the bride get ready, chose the best Bindi, give secret signals on whether the make up is going good or not, and are basically turn into a superwoman of sorts who can handle everything from getting extra hairpins to keeping the bride calm in such times when the bride is ready to explode with nervousness. The bride sits in this small powder room reserved for her at the venue, waiting patiently for her knight on a white horse to come as everybody around her goes into a tizzy the moment they come to know that the baraat is about to reach. I’v been so involved in weddings these days, that I thought I’l share with you guys what all actually happens in an Indian wedding that everybody is exhausted by the time the wedding is over. Let’s begin with the bride’s side. Though the rituals are more or less the same at both the bride and the groom’s side, I personally feel that the bride’s side has more fun! The actual rituals where the bride is involved begin after the Sagan Ceremony. At this particular ceremony, the bride and the groom are given gits from their respective “To be in-law’s”. It marks the beginning of the actual wedding ceremonies. Both the bride and the groom sit down for a Pooja and are then bestowed with gifts. 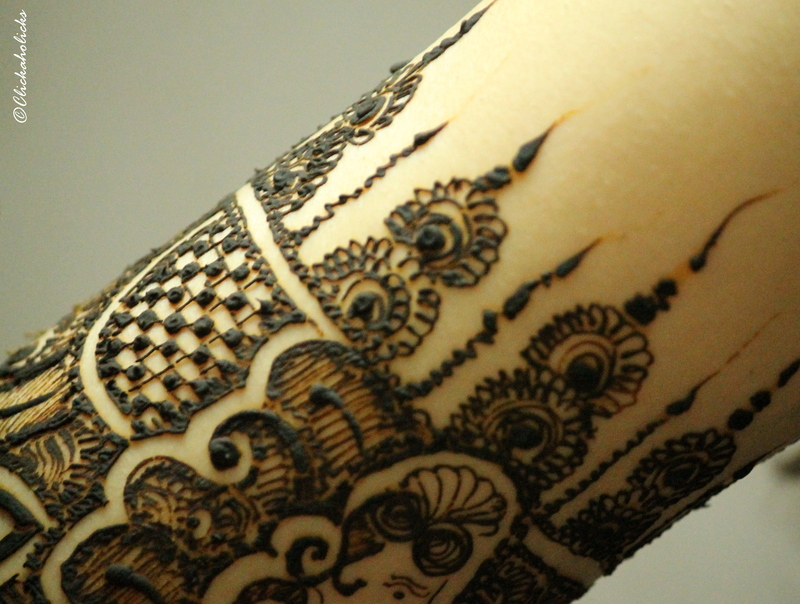 Next comes the Mehendi and Sangeet Function which is usually held a day before the wedding. These day’s this is an elaborate function usually with cocktails. In earlier times, these were very small homely functions where the bride used to apply mehendi on her hands and feet and the women sang wedding songs and thus created that atmosphere of a “Vyah da ghar” which means the wedding home. Now, this function is a BIG thing for everybody and usually the most enjoyable one as most of the family is relaxed at this time and is having a good time dancing and stuffing their face with the chicken tikka’s and malai paneer! I love the mehendi function. More so because I love mehendi so much! 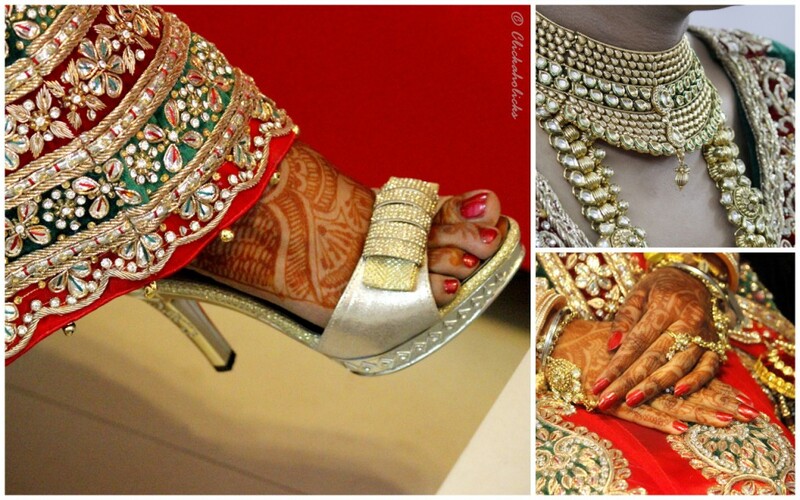 The bride and all the women in the family apply mehendi on their hands and the designs are so pretty! And this is when the all the husband’s would lovingly feed their wives all the yummy food that is being served at the wedding, and move their hair away from their face as the wives can’t touch anything otherwise their mehendi would get smeared and the designs would be ruined. 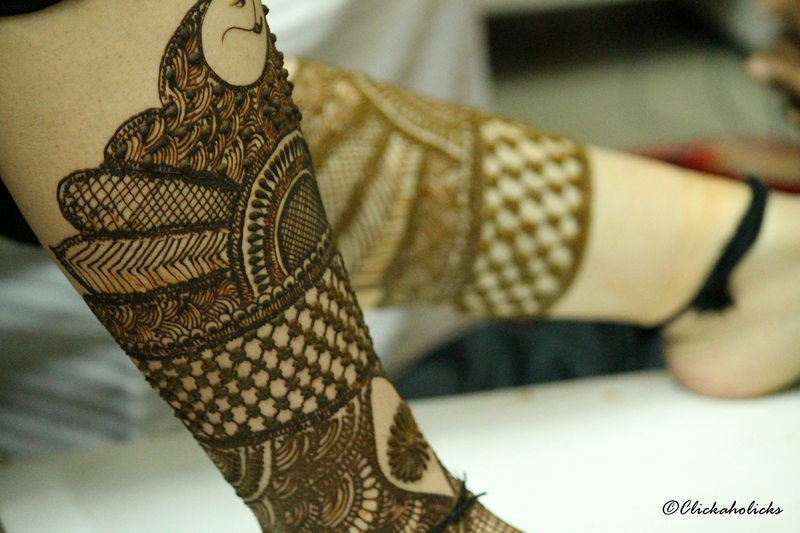 It takes about half an hour to 2 hours for the mehendi to dry depending upon the weather, and the amount of mehendi applied. Usually the mehendi is held in the afternoon so that the bride and ladies can enjoy the sangeet night where the actual wedding party begins. And the sangeet night is when everybody goes bonkers! They dance and laugh and enjoy themselves to the core. The music does not stop till the time everybody is drop dead tired and can barely lift a finger.